LIVIN’ ON A PRAYER has a 90-minute production of BON JOVI’S greatest hits that recreates the image, sound, and stage persona of one of the biggest bands in history. Unlike other tribute bands, no background tracks are used – they are 100% live musicianship! The video above is completely live, taken from concerts around the globe. 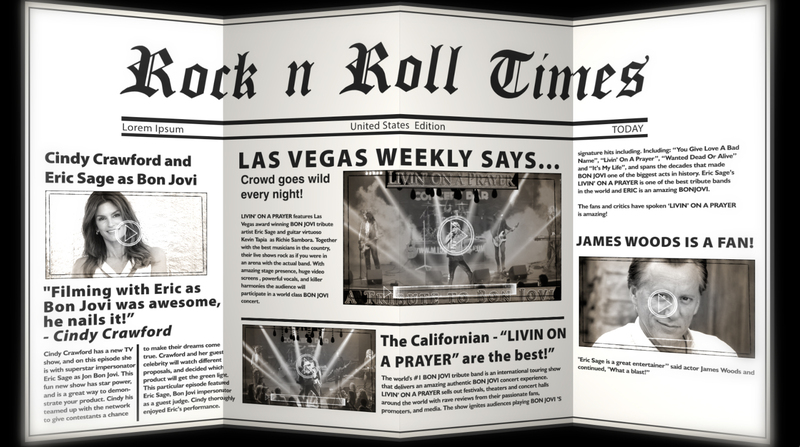 LIVIN’ ON A PRAYER is based out of Southern California, and audiences are amazed at the accuracy of their live retrospective journey through such BON JOVI songs as You Give Love a Bad Name, Wanted Dead or Alive, Livin’ on a Prayer, It’s My life, and many more. The huge video screens, costumes, and audience interaction enhance this world class production!